Stefen Wisniewski will be in the middle of the re-made offensive line. Wisniewski, entering his fourth NFL season, has been a rock on the line since 2011, when he was a second-round pick (48th overall) out of Penn State. Since joining the Raiders he’s played in 45 of 48 games. After playing most of the time at left guard his rookie season, he’s been at center the past two seasons and will remain there in 2014 – possibly the only starter returning to his same spot from 2013. For now, the offensive line figures to be Donald Penn (signed as a free agent) at left tackle, rookie Gabe Jackson or Khalif Barnes at left guard, Austin Howard (free agent) at right guard and second-year pro Menelik Watson at right tackle. There was some talk after last season that Oakland could move Wisniewski back to left guard, but that talk quickly dissipated. Wisniewski – whom offensive line coach Tony Sparano calls “a brilliant kid” for the way he understands his job and calls out blocking assignments at the line – is happy at center. Now, surrounded by young players and veteran additions, Wisniewski’s role will be a unifier, helping a new group come together to function much better than the offensive line group of 2013, which was ravaged by injuries. This season, the Raiders’ O-line has the potential to be a much more physical and productive group, but not all observers are thrilled with what the Raiders have done. This week, for instance, Pro Football Talk ranked Oakland No. 32 (dead last) among NFL teams heading into training camp, and pointed to the re-made fivesome blocking up front -- noting Wisniewski is the only returning starter. But Raiders head coach Dennis Allen recently told a reporter he likes what he’s seen of his new unit in minicamp and OTAs. 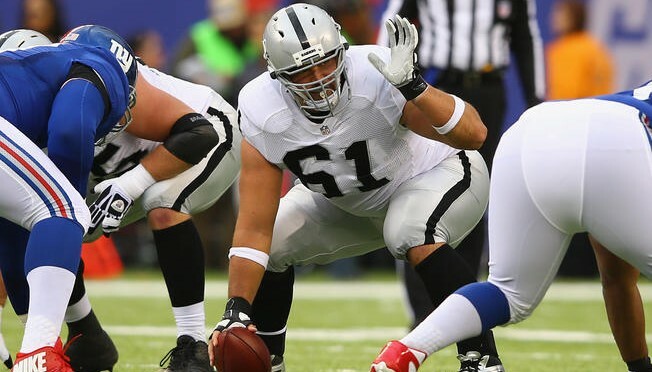 In April, Pro Football Focus noted that all the offseason additions on the offensive line by the Raiders could prove to be a boon not only for the team’s quarterback protection and running game, but for Wisniewski’s growth.